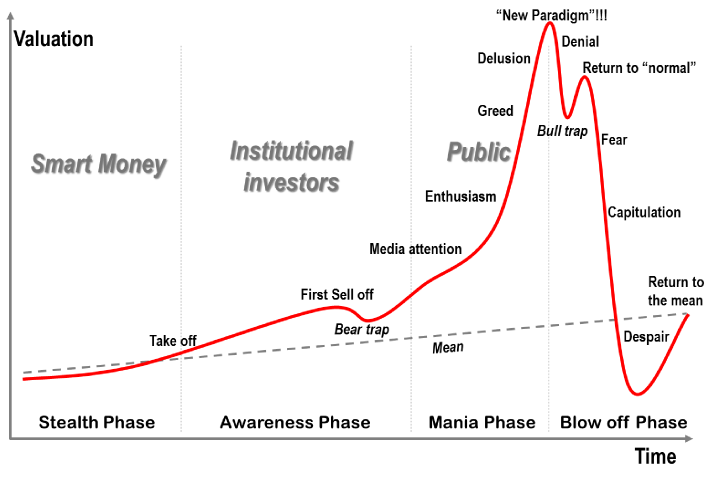 The article this chart is from is worth a read: Stages in a Bubble – below is the introductory paragraph. Business cycles are a well understood concept commonly linked with technological innovations, which are often triggering a phase of investment and new opportunities in terms of market and employment. The outcome is economic expansion and as the technology matures and markets become saturated, expansion slows down. A phase of recession is then a likely possibility as a correction is required to clear the excess investment or capacity that irremediably occur in the later stages of an economic cycle. The bottom line is that recessions are a normal condition to a market economy as they are regulating any excess, bankrupting the weakest players or those with the highest leverage. However, one of the mandates of central banking is to fight a process (business cycles) that occurs “naturally”. The interference of central banks such as the Federal Reserve appear to be exaggerating the amplitude of bubbles and the manias that fuel them. It could be argued that business cycles are being replaced by phases of booms and busts, which are still displaying a cyclic behavior, but subject to much more volatility. Although manias and bubbles have taken place many times before in history under very specific circumstances (Tulip Mania, South Sea Company, Mississippi Company, etc. ), central banks appear to make matters worst by providing too much credit and being unable or unwilling to stop the process with things are getting out of control (massive borrowing). Instead of economic stability regulated by market forces, monetary intervention creates long term instability for the sake of short term stability.